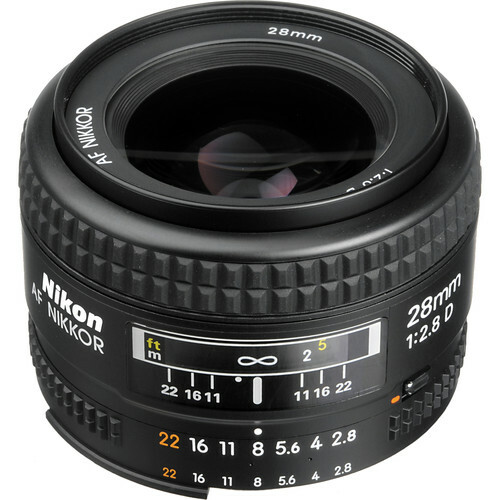 A comfortable wide-angle, the Nikon AF NIKKOR 28mm f/2.8D is a compact and versatile lens well-suited for landscape, nature, and documentary shooting. Its modest f/2.8 maximum aperture strikes a balance between its sleek form factor and being fast enough for working in low-light conditions. In regard to the optics, a Super Integrated Coating has been applied to individual elements to control flare and ghosting for improved contrast and color rendering when working in bright and backlit conditions. Additionally, a rounded seven-blade diaphragm contributes to a pleasing bokeh quality. 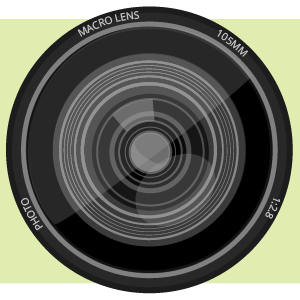 Wide-angle prime lens is designed for FX-format Nikon F-mount cameras, however can also be used with DX models where it provides a 42mm equivalent focal length. Flexible f/2.8 maximum aperture suits working in a variety of lighting conditions and also offers depth of field control for isolating subjects. Autofocus system is compatible with select Nikon DSLRs that support D-type lenses, and offers quick and precise focusing performance. Box Dimensions (LxWxH) 4.3 x 4.1 x 3.6"
AF NIKKOR 28mm f/2.8D Lens is rated 4.5 out of 5 by 80. Rated 5 out of 5 by Jason from Quickly becoming a favorite! I bought this lens to go with my D300 I wasn't happy with the crop factor the camera had with my 50mm f1.8 lens. I needed a wider angle of view and I needed a lens fast enough for low light photography. This lens fits the bill nicely and even managed to surprise me. I was concerned about some reviews on this lens, particularly regarding sharpness but I spent some time with it and produced very sharp photos. This lens focuses very quickly and you can be less than a foot away from your subject! I have noticed some distortion when shooting wide open on FX sensors, but that is a common occurrence with most lenses and nothing Lightroom or PhotoShop can't fix. Rated 4 out of 5 by Synchro from Good Multi purpose lens I use this lens as my main walk around lens on my Nikon D90, I chose this over the Nikon 35mm 1.8 DX lens, which has a narrower field of view and doesn't wrap enough into the image. This is also an FX lens and will work on FX bodies (Nikon D700) if you plan on upgrading to Full frame, the 35mm 1.8 is DX only. The focusing is very fast and sharp. Excellent lens to include in your kit at a good price, since the 24mm is much more $$ for a field of view that is slightly wider. The bokeh is not spectacular but does give some nice soft backgrounds. Video trick for the Nikon D90: For video on the Nikon D90, switch to live view and start recording, then unclip the aperture lock and adjust the aperture ring to match your lighting. Rated 4 out of 5 by Little Fish Photography from Great lens I got this lens to use in tight spaces and it works great. I was tired of backing up. This lens lets you get up close and personal, but it does take some getting used to if you are used to using a zoom lens. I have three other lenses, the 18-55 (not good for much); the 70-300 (good for portraits but ya gotta back way up) and the 2.8 80-200 (LOVE IT, chose not to get the VR b/c of cost, but I use this for all my outdoor sports photography.) I debated on this lens vs. the 2.8 24-85 (b/c of the zoom), but I went with this one b/c of the price and I wanted a prime lens. It forces you to frame your shot instead of letting the zoom do it for you. A good lens for the price. Rated 4 out of 5 by Fixed+Aperture from Good Value I like to capture the moment and it is quite hard to do when you have a enormous lense in their face, so with this lense I can get in there and get the shot. I have a 50mm f.1.4 which is one of the sharpest Nikkor lenses I have ever used but with a DX sensor it can be quite narrow at times. The 28mm lense has been perfect for getting that extra bit in the frame without losing too much speed or quality. I have been practicing digital photography for about 3 years now, and I have never been let down by a Nikon prime lense and with this one being such a great price it was hard to resist. Rated 5 out of 5 by jimmyd from Really, really nice. I have gotten so tired of big heavy zooms I went back to the basics. I like zooms they have a place like fixed lenses. But I like fixed better because it forces you to use it as what you bought not just a framing lens. This 28mm is excellent, I have always been a 28 fan because of it's subtle wide-angle perspective on film. When I say I have gone back to the basics, I parked the zoom and got a 16mm 2.8, 20mm 2,8, 28mm 2.8 and a 50mm 1.4. Using a lens for is mm value is fun, slow down and try it. Not to mention the picture quality it sharp. Rated 4 out of 5 by Ron from Nice glass for the price I bought this lens after a lot research. My main objective was to find prime 24mm either 1.8 or 2.8. I opted for the 2.8 and very satisfied. Optically nice on both my D800 and D7000! Sharpest image at 5.6. Thru. F8. Ok wide open, good bokeh, nice color saturation. Lot of CA at ISO 3200 and above. Not a problem for me, I normally shoot no higher than 1600. Bottom line; good wide angle lens, price is right, sharp, autofocus is fairly fast and pretty accurate. Build not up to pro standard but feels sturdy even though made of plastic. If you need a wide angle lens and don't want to spend a lot of $$s...try this glass...you won't be disappointed. Nikon was spot on with this one.